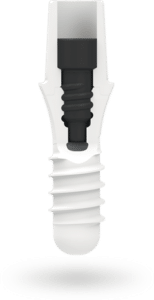 Zirconia Dental Implants have been on the market for several years, but Natural Dentist Associates has never been more excited about placing them until about 4 months ago when the Swiss made Zeramex Zirconia Dental Implant achieved FDA approval. “Design of (Zeramex Dental) implant system enables easy replacement of a single tooth or a full mouth of teeth with zirconia dental implants”. This statement is a very big deal. Many people need all their teeth replaced. The only implant option in the past when replacing a full mouth of teeth has been to use Titanium Dental Implants. Now we can literally replace a full mouth of teeth easily with metal free Zeramex Zirconia Dental Implants, Zirconia Abutments, and Zirconia Crowns. Titanium technology has been around a long time and is quite evolved. Titanium implant dentistry is a very tried and tested way to replace teeth, and the dental profession has had a lot of success replacing teeth with them. In recent years there has been increased demand for metal free and tooth-colored dental implant options. Solutions such as All on 4 and teeth replacement cases involving 3 or more implants and crown/bridge work are now practical and easy with the Zeramex Implant system. Zeramex has advanced Zirconia Implant technology out of the implant “dark ages” and into todays world of implant dentistry. The Zeramex implant has brought Zirconia Dental Implants a long way, but differences still exist between zirconia and titanium implants and zirconia and titanium dental implant procedures. Zirconia Dental Implants are metal free and in combination with a zirconia abutment and zirconia crown, we can replace missing teeth with a full nonmetallic option. As a matter of providing treatment plan options to our patients, we present our patients the options of either Zirconia or Titanium Dental Implants. Patients with other metals in their mouth or who need metal free options may be better served with a Zirconia Dental Implant. Due to the healing period of dental implants (9-11 weeks for titanium and 3-4 months for zirconia) PRF treatments are recommended. PRF treatments are also very beneficial in Wisdom Tooth Extraction sites. PRF is highly recommended in areas where root canals and necrotic teeth have been removed. Some Dental Surgeons believe PRF may soon emerge as the standard of care for all tooth extractions sites.